Last July, two thousand people gathered under a warm sun at the Tom McCall Bowl near Portland’s Riverplace Marina. Led by the Last Regiment of Syncopated Drummers, a parade of people, outfitted in colorful swimwear, marched past the Riverplace shops and restaurants. The participants, carrying inner tubes or more elaborate flotation equipment followed the drummers and then turned toward the river at “Poet’s Beach,” a Willamette River entry point under the downtown end of the I-5 Marquam Bridge. The procession followed a path down the embankment and waded into the river. Hundreds of people paddled, or simply floated, letting the gentle current carry them downstream, returning to the Bowl. Back on shore they enjoyed an afternoon of music, refreshments and general merriment. The big party, called The Big Float, celebrated the Willamette River’s return to relative cleanliness – clean enough to swim in, anyway. Decades ago, on sunny spring Saturdays, co-workers and I would take lunch breaks by the river. From the warehouse where we worked, located in what was to become known as Old Town, we dodged speeding traffic to cross the expressway that was Harbor Drive, across a grass median to the seawall and down the steps to a docking platform on the river. There we would eat our sack lunches, and tell teenaged lies to each other. The river was not safe for swimmers then; it was dark and murky and we could see the trash floating by. I started as a packer. Boxes filled with merchandise would slide down a chute from the second floor. A packer would move an order to his station. The job was to securely pack them using excelsior packing material, seal with brown tape and affix shipping addresses, also noting on the boxes how many packages were in the shipment. Adjacent to the packing room was the office. Bill and Sam Naito’s desks were there in the open – no private offices. Their father, Hide Naito, had a desk in the corner. I never saw him speak. Being teenagers, we thought he was there only because the brothers were respectful Japanese sons and made a place for him. Much later I learned that the father was the founder of the business. The packers were at the bottom of the hierarchy. Talking was not allowed. We did, of course. Periodically, Bill would come out, cigar stub in mouth and say in his slightly ironic way to the offending worker, “Uh, no talking!” Sam spoke to us less frequently, but several decibels higher. After performing satisfactorily for the requisite time in the packing room, I was moved upstairs to the second and third floors and a job as a puller. Pullers were given customer orders, the items printed in order according to location in the warehouse. Pushing a cart, we pulled the items from shelves and put them into boxes. When an order was finished, we sent it down the chute to the packing room. Upstairs we saw less of Bill – or Sam – and talking was not officially banned there. We worked for the minimum wage of $1.25 per hour. Bill personally handed out the checks each payday. By Thanksgiving, the shipments out of Norcrest had dropped significantly. The merchandise had been shipped around the country to stores for their Christmas season. Many of us were transferred across the street to another Naito business, the retail Import Plaza, as it moved into its busy holiday shopping season. The crew there also was largely high-school age. The scruffy workers that came over from Norcrest worked mostly behind the scenes, unpacking merchandise and stocking shelves – and also trying to catch the eyes of the female cashiers in the front of the store. Our pay was reduced to $1.00 per hour. At that time, businesses not involved in interstate commerce were not subject to the minimum wage law. Apparently, Import Plaza was not considered to be doing any interstate commerce. At the end of the workday, going home involved navigating the several blocks to the bus stop past the Skid Road denizens, who often suggested making a donation to help support whatever their alleged needs were. After Christmas, most of the student employees were laid off. For those of us who were working to earn spending money and were not dependent on these jobs for our livelihood, it was convenient to have the layoff coincide with the holiday break from school. Bill and Sam’s parents, Hide and Fukieye Naito, came to the U.S. from Japan in 1912. They founded a successful import business and after a time opened Naito Gifts in downtown Portland. (Later they opened a second store at the new Lloyd Center.) As youths, Bill and Sam helped out in the business. After the Japanese attack on Pearl Harbor, President Roosevelt’s executive order required Japanese-American families within 200 miles of the Pacific Coast be removed to internment camps. Hide Naito moved the family to Salt Lake City to avoid internment. Bill went into the Army after graduation from high school in Utah. He served in the infantry and then as a translator with military intelligence in postwar Japan. He returned to Portland and graduated Phi Beta Kappa from Reed College. He then went to University of Chicago for a Master’s degree in economics. Bill then came back to Portland and joined Sam in running the family business, which by then had been incorporated as Norcrest China. As we moved into a new year, Norcrest China began hiring us back. It gradually got busier as the year progressed. On sunny spring days, we found places outside to take our Saturday lunch breaks. The workdays were more relaxed than the pre-Christmas time. As graduation approached, Bill somehow let those of us who were seniors know that the time to move on was also nearing. This job was part-time for high school students. The expectation was for us to go on to college or find our career path. For me, it was off to Spokane for the first two years of college, and then to the University of Oregon. For the Naitos, the wholesale and retail businesses led to real estate development. They purchased the old White Stag building near the Burnside Bridge and moved Norcrest China into it. They took over maintenance of the landmark White Stag sign on the building’s roof, eventually changing “White Stag” to “Made in Oregon,” to promote their growing chain of retail stores. At Christmas time the nose on the leaping stag turned to red, a Portland tradition. With Made in Oregon, after decades in the import business, the Naitos expanded into merchandising locally sourced products. Bill emerged as a booster of the city of Portland, especially the Skid Road area where his businesses were located. He worked to rename it “Old Town.” The Naitos donated space for the nascent Portland Saturday Market. He was an early booster of light rail and streetcars. Other Naito projects included the Galleria building, converting the former Olds & King department store into several floors of retail shops. The building today houses a new Target store. The former Montgomery Ward building, a landmark in Northwest Portland, was renovated into a modern office building. McCormick Pier Apartments, on the riverfront near the west end of the Broadway Bridge, was a precursor to the development in nearby Pearl District. In the mid-seventies, Harbor Drive was torn up and downtown Portland began to reclaim its riverfront. In place of speeding automobiles, construction started on Waterfront Park. This open space was later named for Tom McCall (’36), Oregon’s governor who promoted its development. 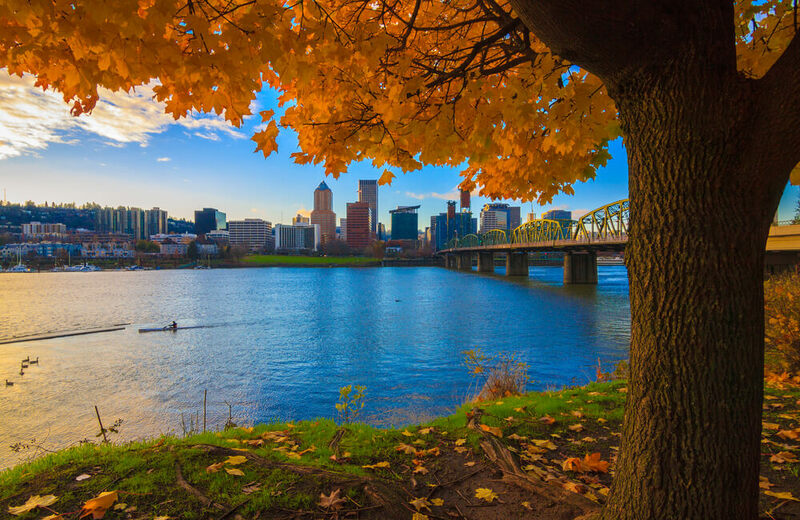 It is Portland’s gathering place, hosting events such as the Waterfront Blues Festival, the Oregon Brewers Festival, the Bite of Oregon, Cinco de Mayo and numerous Rose Festival events. A major feature of the park is the Japanese American Historical Plaza. Bill Naito was the driving force behind the non-profit Oregon Nikkei Endowment’s effort to build a memorial to those who were deported to internment camps during World War II. Artwork tells the stories of Japanese people in the Northwest. Bill Naito died of cancer in 1996. Some time afterwards, the families of Bill and his brother Sam made the news when they settled a long-simmering rift by dividing the H. Naito Company in two parts. Bill’s heirs took over the real estate management part of the business, forming Bill Naito Properties. Older brother Sam took control of Made in Oregon. Sam is president of Naito Properties, which includes the ten Made in Oregon retail stores. Front Avenue, bordering Waterfront Park, became Naito Parkway. The park, on the west side of the Willamette, now connects with the Vera Katz Eastside Esplanade. Named after Portland’s mayor from 1993 to 2005, the esplanade joins with Waterfront Park via the Hawthorne and Steel bridges. Walkers and joggers and bicyclists can make a loop along both sides of the river. In 2009, the Bill Naito Legacy Fountain was dedicated next to the Saturday Market pavilion at the north end of Waterfront Park. It’s an interactive fountain meaning kids of all ages can splash around in it. As I floated and paddled my way back to the party, taking in all the riverfront scenery, my thoughts were of the changes in the city and myself and of the people who brought about so much of it. George Rothert has previously published: English-as-second-language study program; Cavalier magazine; Historical Society of Santa Rosa. After 20+ years in California wine country, he has recently returned to Portland OR, where he grew up. Read more articles by George Rothert. All original work attributed to George Rothert © 2017 George Rothert.